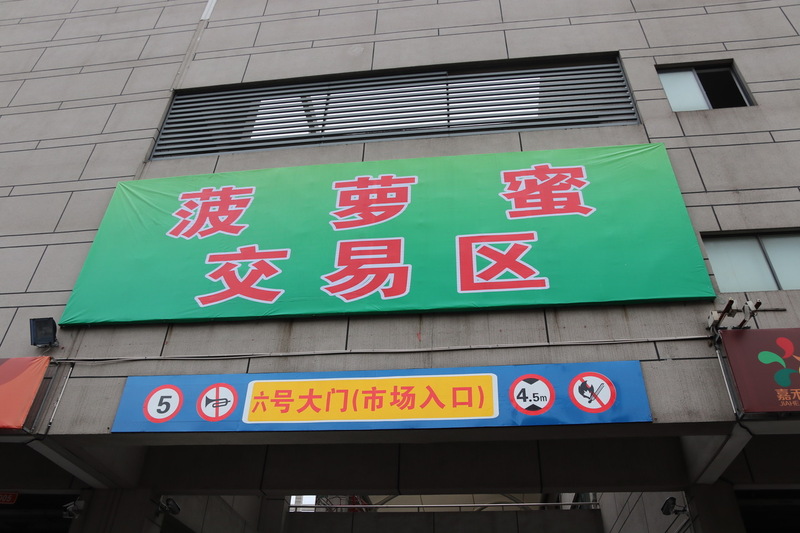 Jiaxing Fruit Market in Zhejiang has become a crucial center for the distribution of fresh fruit from Southeast Asia. This status has been cemented by the opening of the Jiaxing Haiguangxing Premium Fruit Market in September 2018, which is specifically focused on imported fruit. As one of the investors in this new market, Jiaxing Fruit Market hopes to benefit from the increasing popularity of the jackfruit in China. In recent years, jackfruits have enjoyed particularly brisk sales, even almost overshadowing durians in terms of sales performance. In 2016, Jiaxing Fruit Market traded only 2,349 tons of jackfruits but in 2017, trading volume had rocketed to 29,300 tons. By late-December 2018, this figure had further climbed to surpass 38,200 tons. 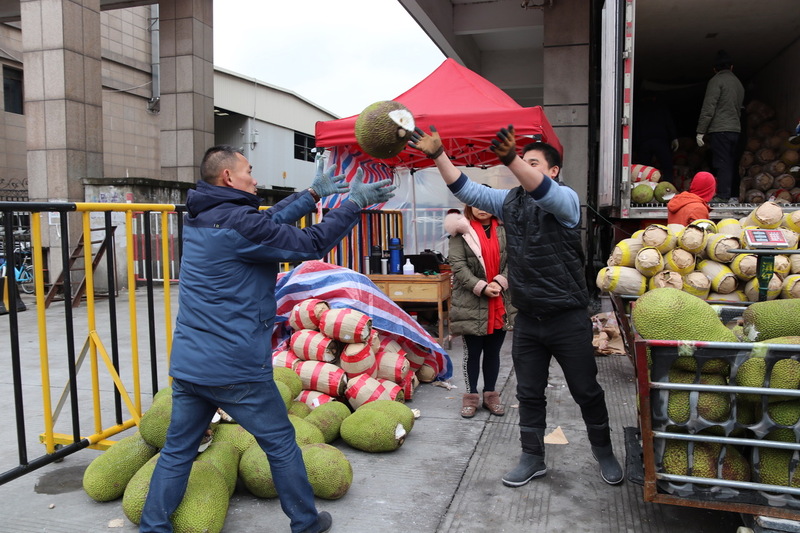 As a result, a specialized trading area for jackfruit has been opened at the market, by far the largest of its kind in China. There are two main varieties of jackfruit which enjoy popularity at the Jiaxing Fruit Market: jackfruit with red flesh from Vietnam and yellow-fleshed jackfruit from Thailand. The red-fleshed jackfruit ranges in shape, from oval to more of a round, plump shape, and its flesh isn’t red in color, but rather golden yellow. As it has fewer fiber strands, it boasts a high percentage of edible flesh – nearly 50% of the 6-kilogram fruit is edible. The red-fleshed jackfruit also possesses a strong fragrance and sweet taste, with a sugar content reaching upwards of 25%. In comparison, the yellow-fleshed jackfruit is larger and has a pale-yellow flesh. It also has more fiber strands than the red-fleshed jackfruit, resulting in only 20%-25% of the 10-kilogram fruit having edible flesh, as well as a lower average brix level of roughly 17%. Given its lower production volumes, the red-fleshed jackfruit is sold at a higher price than its cousin the yellow-fleshed jackfruit, around RMB 6.5 - 8.5, or $0.95 - $1.24/kg, for red-fleshed jackfruit compared to the RMB 4.0 - 5.0, or $0.58 - $0.73/kg, for yellow-fleshed. Nevertheless, sales for the red-fleshed jackfruit still remain strong. As the largest tree-borne fruit, one jackfruit can weigh as much as 55 kg, making it practically impossible for the average consumer to buy whole at a time. Moreover, it is also a daunting task to cut and prepare the fruit – for this reason, most jackfruit available at the Jiaxing Fruit Market are pre-cut and prepared for consumption. 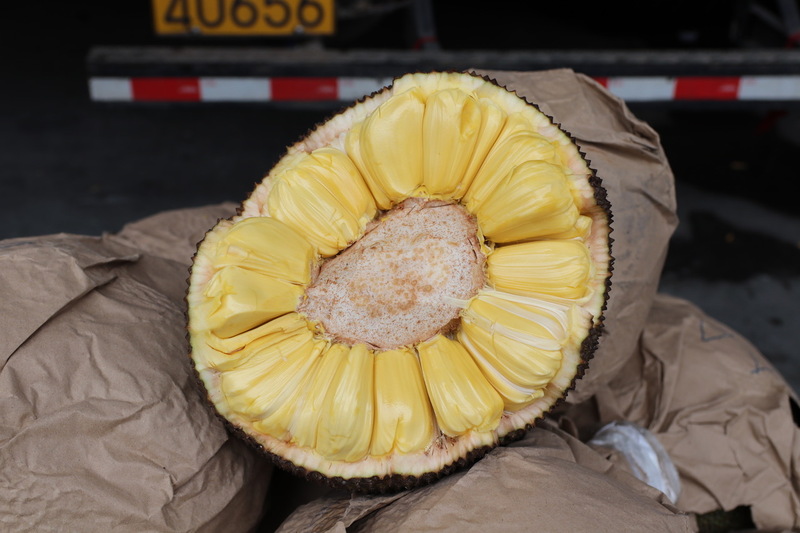 Mr. Hu Sunfei, Deputy General Manager of Jiaxing Fruit Market, told Produce Report that the market now has very mature and stable distribution channels for jackfruit. 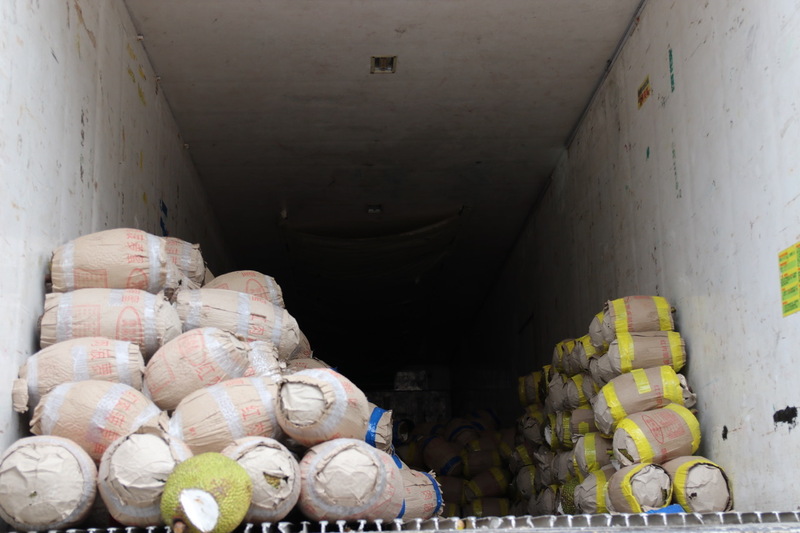 The season for jackfruit sales runs from October to late May, with the majority of jackfruit from Thailand and Vietnam loaded on specialized trucks, which can carry up to 25 tons of jackfruit, and transported to Jiaxing via land routes through a pass in Pingxiang City, Guangxi Province. "You can find fresh jackfruit for sale at our market a mere six days after being loaded at their places of origin." In an interview with Produce Report, Ms. Aschariya Juntaravong, Consul (Agriculture) of the Agriculture Section of the Royal Thai Consulate-General in Shanghai, noted that jackfruit production is centered in the southern and central regions of Thailand, where the fruit is available year-around but peaks in April and May. According to data provided by Ms. Aschariya Juntaravong, Thailand exported 38,709 tons of jackfruits valued at roughly $14.67 million in the first eleven months of 2018, of which exports to China accounted for 47.1% of total Thai jackfruit exports by volume and 55.5% by value. ▲As required by China Customs, to prevent harboring of insect pests, a small slit is made to the jackfruit and lime is applied to the cut. Major global jackfruit producers include India, Bangladesh, Thailand, Indonesia, Vietnam and Malaysia. As early as 2012, Malaysia's Ministry of Agriculture was involved in talks with the Chinese government to export pineapples and jackfruit to China and in August 2017, it gained market access to China for pineapples. However, Malaysian jackfruit still remains to be approved for import in China. 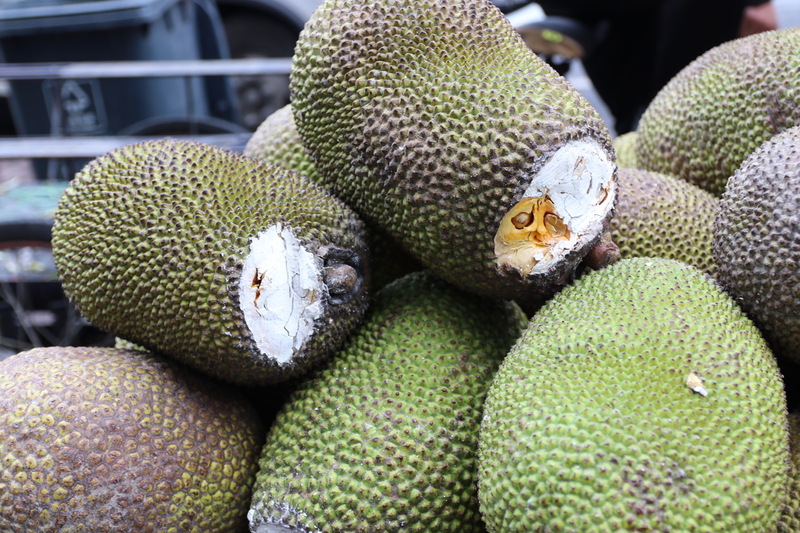 According to the Malaysian media, Malaysian jackfruit are known for their excellent quality; however, their export is somewhat held back by insufficient marketing efforts.